Air Eraser Kit can be used anywhere an abrasive is required to delicately erase; such as decorative etching on glass. Can also be used by the professional technician, manufacturer, hobbyist or for dental lab work, erasing color, removing rust or smooth castings. 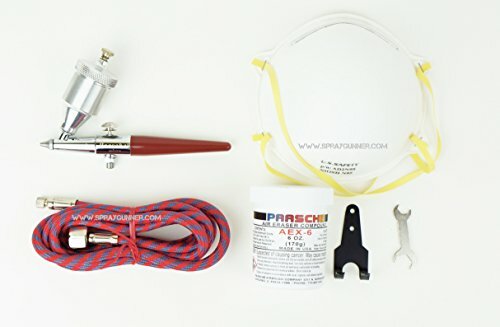 AEC-K Kit Includes: One AEC Air Eraser with Hardened Stainless Steel Tip, one jar of AEX-6 Fast Cutting Compound, one-4' Air Hose with Moisture Trap, Wrench, Hanger, 5 Disposable Respirators and Parts Sheet. Erases color, and can be used for removing rust or smooth castings. If you have any questions about this product by Paasche, contact us by completing and submitting the form below. If you are looking for a specif part number, please include it with your message.